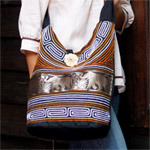 Using cotton and polyester, the Lanna bags artisans craft this beautiful shoulder bag by hand. The top and bottom labyrinthine motifs frame elephants and flowers woven into a gold and black ribbon. 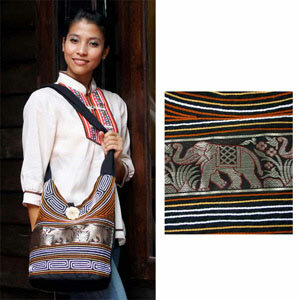 The bag fastens with a hoop over a flower button carved from coconut shell. The interior is fully lined and has two pockets.